Five people have appeared in court in connection with a mass brawl which broke out after an Old Firm match. 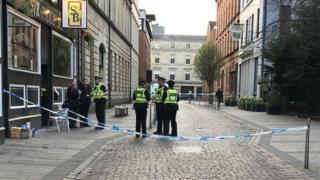 Gemma Martin, 24, William Barclay, 27, Khal Cullen, 23, James Quinn, 21 and Andrew Quinn, 25, were charged at Glasgow Sheriff Court following last month's incident in the Merchant City. The are accused of conduct in a disorderly manner, engaging in a stand up fight and breach of the peace. The five appeared from custody and made no plea. They were bailed pending their next court appearance.